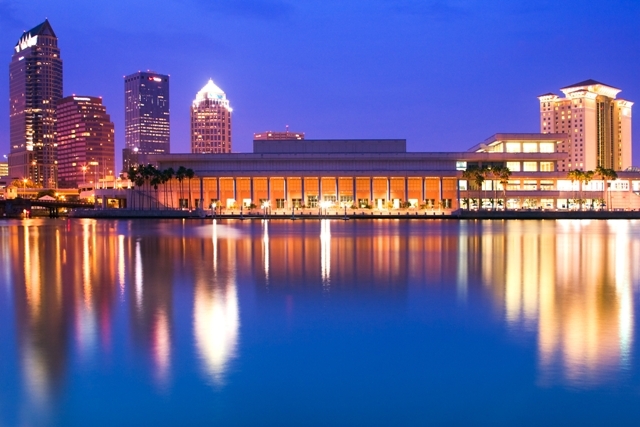 Tampa Convention Center — they get an A+ for hospitality and organization. They are ready for the hoard of United Methodists. And the UMC is ready as well. It is impossible not to be impressed by the pageantry and preparation. But it is also a little depressing. I just walked through the Cokesbury and General Agency display areas. As always, the dog and pony show has been upgraded to elephant and stallion levels. You cannot believe the mountains of crap that have been produced and stamped with the General Conference logo. Stewardship be damned. This is a marketing event, a media circus. One of the General Agency staff people commented, “A few years ago it was tables and chairs, but now it’s like, ‘If you’re going to get rid of us, we want you to know about everything we do.” And it shows. This looks and feels a lot more like a trade show than a religious gathering. BIG displays, BIG ideas, and BIG money have been lavished on this GC. Be careful not to ask where the money came from to pay for all this — just consume and enjoy, sipping your water from the official GC2012 water bottle, while resting in your GC2012 hoodie sweatshirt, while leafing through your commemorative GC2012 CEV Bible… And we justify all this how? I know, I know, get over myself. Why do I have to spoil everything? Could I be any more of a buzz kill? Did I come here just looking for things to be unhappy about? You know, I get tired of it myself sometimes. I want to enter into our denominational celebrations and feel elation and joy. But it is just my nature to resist and resent the circus-like aspects. I hunger for authentic opportunities to celebrate the faith with my brothers and sisters. I cannot wait for the worship and learning opportunities to commence. But all the consumeristic, self-serving, promotional/trivial junk leaves me cold.